It’s not quite freezing here but warm breakfasts are always nice this time of year especially if you wake up to a cold house. I’m still battling that cold so a healthy warm breakfast is exactly what I need. This porridge is made by toasting the oats and boiling the water and letting the oats absorb the liquids so that it’s nice and fluffy and not starchy and slimy like most porridges. 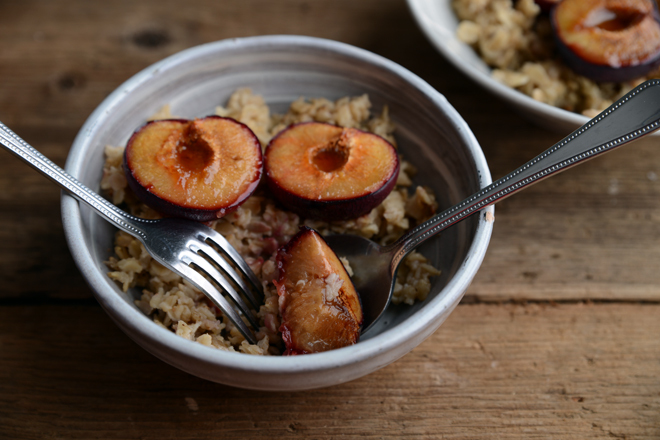 I love making porridge like this, it gives the oats a slightly nutty flavour and having soft juicy sweet roasted plums on top is a nice way to have your fruit in the morning and makes you feel all cosy inside, even if there is a little sugar on them. I finally found time last night after dinner to cosy up with pj’s on and watch a Christmas film, I suppose that's the only slight sliver lining to being ill but I still have the same amount of things to get done and less time to do them in. 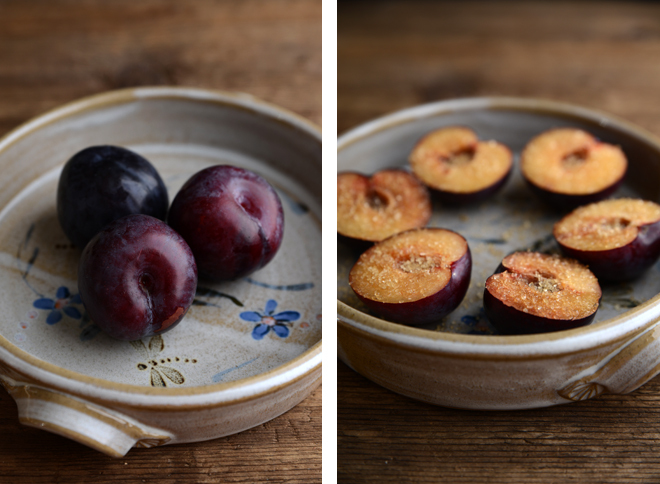 Slice the plums in half and take the stones out, place in an oven safe dish cut side up and sprinkle with demerara sugar. Place in the oven for 20-25 minutes or until soft and juicy. 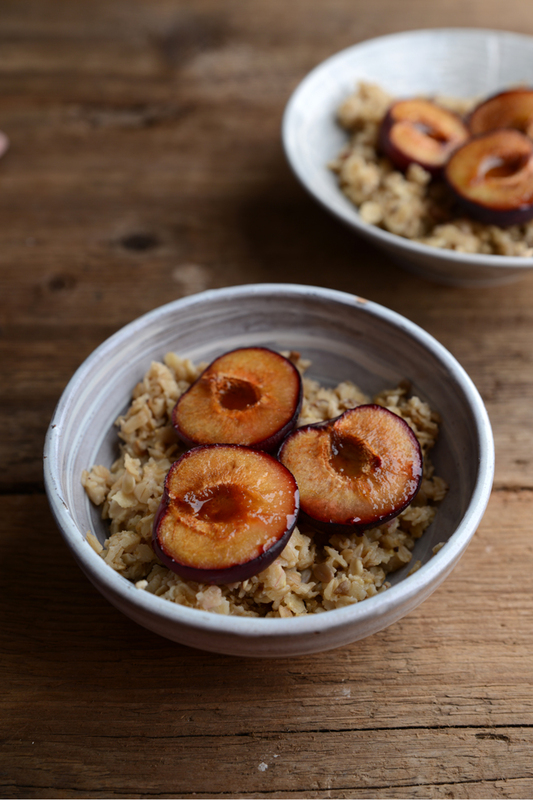 While the plums are roasting melt the coconut oil in a small frying pan and add the oats and sunflower seeds to toast. Put the water, milk, ginger and sugar in a saucepan and bring to the boil, once the oats have toasted add to the boiling water, stir, put the lid on and take off the heat. Leave the oats for 5-15 minutes to absorb the liquid. 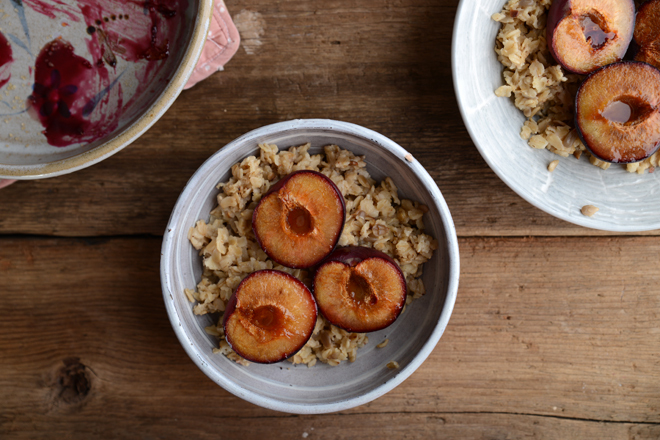 Once the oats have fluffed up and absorbed the mixture serve in a bowl and top with roasted plums straight from the oven.